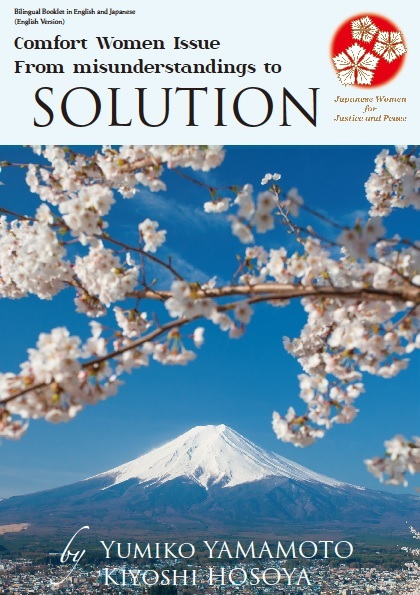 “Comfort Women Issue: From Misunderstandings to Solution (慰安婦問題 誤解から解決に向けて)” is the title of a 2016 booklet published in both English and Japanese by Nadeshiko Action authored by Yumiko Yamamoto and Kiyoshi Hosoya and translated (badly) by Kiyoshi Hosoya and Sharon Isac. The booklet starts with a revisionist overview of Japanese history which claims that “Japan is classless society. We have no history of slavery. We have very little sense of discrimination. We treat people at disadvantage with compassion and warmth, as did the Japanese military during WWII.” It reproduces the same old denier arguments that have been thoroughly debunked decades ago. Hosoya and Yamamoto have been distributing copies of this booklet at the UN Commission on the Status of Women NGO Parallel Events (2016) and elsewhere. United Nations Commission on the Status of Women (CSW) NGO Parallel Events are a series of events held around the United Nations building by non-governmental organizations from around the world working on women’s rights while the U.N. Commission on the Status of Women meets at its headquarters in New York. 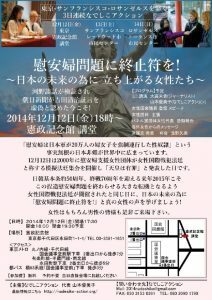 In 2016, Japanese right-wing groups infiltrated the NGO Parallel Events by submitting innocuous-looking proposals to the organizers of NGO Parallel Events with the goal of promoting comfort women denial and Japanese nationalism. Two such events were held. On March 16th, denier group Global Alliance for Historical Truth presented a panel titled “Misunderstood Comfort Women” which denied the history of comfort women. 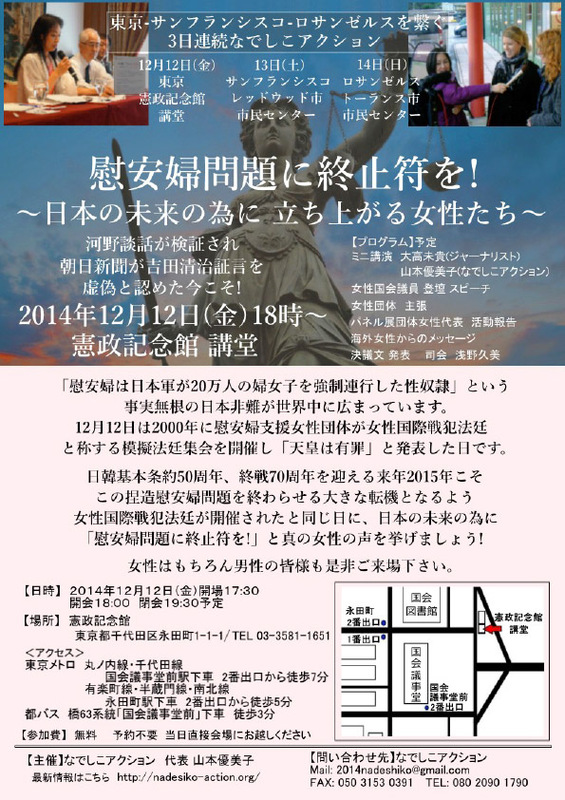 The panel was facilitated by Terumi Imamura and speakers were Koichi Mera, Kiyoshi Hosoya, and Mio Sugita. 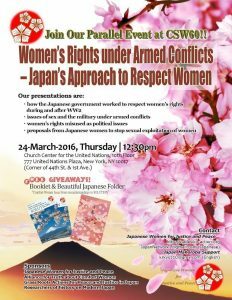 Denier group Nadeshiko Action (Japanese Women for Justice and Peace) sponsored a panel titled “Women’s Rights under Armed Conflict: Japan’s Approach to Respect Women” on March 24th. The panel was facilitated by Shizuko Culpepper and speakers included Yumiko Yamamoto, Koichi Mera, Sharon Isac, Kaoli Koyasu, Mieko Green, and Charlotte Meyer.